You might recall the Reds sweeping a 4-game series from the Dodgers earlier this season. 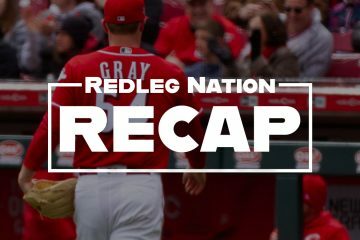 It kicked off the Era of Good Feels that lasted just long enough to undermine the Reds’ resolve to do what they needed to at the trade deadline. Raisel Iglesais had three saves in that series, the same number he’s had in the last month. So you can imagine more than just competition for the second Wild Card slot was motivating the Dodgers tonight. But the Reds were the ones who dispensed payback, scoring three runs off arch-villain Ryan Madson. Madson was last seen intentionally hitting Joey Votto with a pitch for the Washington Nationals, costing the Reds first baseman more than a month of full effectiveness. The Reds are 5-0 against the Los Angeles Dodgers and their $200 million payroll. Cody Reed went four innings, allowing three runs. Reed gave up three walks and struck out five. He threw 83 pitches. While Reed wasn’t great, he’d have made it through at least one more inning if the defense had been better behind him. More on that in a minute. Jim Riggleman’s quick hook likely cost Reed a win tonight as the Reds scored two runs in the fourth inning for a 7-3 lead. That only matters because the likes of Thom Brennaman will continue to prattle on about Reed and pitcher wins. Michael Lorenzen took over for Reed and pitched 2.1 innings. Lorenzen struck out three and walked one, pumping 97-mph fastballs. But he gave up a solo homer and got in trouble in the 7th. Riggleman then called on Wandy Peralta who allowed all three batters he faced to reach base. The Reds still use Peralta like he’s good, when he hasn’t been good since April 2017. Peralta’s departure with the bases loaded set up a dramatic 11-pitch at bat by Yasiel Puig vs. Jared Hughes with one out in the 7th. Puig quickly got Hughes’ favorite sinker ball pitch timed up and continued to foul it down the third baseline, several times on hard hit balls that were just foul. Finally, Puig hit a rocket fair down the third baseline that luckily for the Reds was a leather-seeking missile tracking Eugenio Suarez’s glove. It resulted in a line-out double play. Hughes retired the Dodgers in order in the 8th. Raisel Iglesias pitched a shutout 9th. Joey Votto turned 35 today and his bat got the Reds on the board in the first inning. After a walk by Billy Hamilton and a single by Jose Peraza, Votto doubled off the literal top of the right-field wall, missing a third consecutive game with a home run by an inch or maybe two. Scooter Gennett followed with a single off the right field wall scoring Votto. After a single by Phillip Ervin, an error by Manny Machado plated Gennett, making the score 4-0. Eugenio Suarez led off the bottom of the 3rd inning with his 32nd home run of the season. Suarez had 26 last year. His ISO (isolated power) is way up. The Reds added a lucky run in the 4th. After Hamilton softly doubled down the left field line, Jose Peraza lined a single to left. With just one out, Reds third base coach Billy Hatcher waved Hamilton home where he would have been out by 15 feet with an average throw and catch. It took a throw way up the third baseline PLUS a dropped ball to avoid the out at the plate. Bad base coaching, there. Scooter Gennett later drove in the Reds seventh run with a single. Scooter Gennett had a big night with four hits. Phil Ervin had a single, double and just missed a home run. Jose Peraza had two hits and couple stolen bases. Joey Votto walked on his birthday. Of course he did. The Reds were facing a LH starting pitcher tonight. If you stack up all the team’s hitters this year based on run creation against left handed pitchers, the second best is Scott Schebler (wRC+ 136). The worst has been Billy Hamilton (wRC+ 63). So guess who led off and guess who sat the bench. Scooter has raised hit hit total to 170. Still has a shot at 200! I was hoping one of the Reds hittersÃ¢â‚¬â€particularly VottoÃ¢â‚¬â€would send a screamer back up the middle when Madsen was pitching. Maybe cause a little incontinence. Scooter 4-5!! Now hitting .329 in Aug-Sept. He smells that batting title!!! Pitching? If we EVER have anyone that looks good…just wait on their next few appearances. They will get shelled. Its automatic. Disco. Castillo. Harvey. Lorenzen. Sims. Reed. Whoever. Lorenzen tonite….1-2-3 with 2 Ks….throwing 98. Hits a double and sprints into 2nd base then you knew he would struggle the next inning. I think he just gets too jacked up? Castillo. Have him in my fantasy playoffs but no way I start him against LA and their 15 power hitting lefties. Someone suggested lefties Heaney or Skaggs from the Angels. They’re wasting Mike Trout’s greatness! They may make a deal if you throw enough young talent in their direction. They need to do something because continuing to count on the pitching in this organization to suddenly “blossom” is not going to cut it? Ã¢â‚¬Å“Well, itÃ¢â‚¬â„¢s damn near impossible because on the free agent market a power hitter is not necessarily gonna want to come here,Ã¢â‚¬Â Sabean said Thursday on KNBR. Ã¢â‚¬Å“Because they know the park factor. The Reds were 98.4% to win, going up 10-4 and yet…Puig was tying run vs. Hughes. That is a team that could be constructed this winter, with Lorenzen as a CF. Crazy thing was I looked up the 2012 (or 2013?) Reds and they were like 6th in team ERA in this same park? Like you said…its crazy. No lead is safe…it seems worse then Coors now? 13-12 vs Milwaukee not long ago? I think pitchers would come here though…if the $ was right. Bonus – Guys are still being “sorted” as SPs without being overburdened. Just love beating the stinking Dodgers. I know a lot of my friends here, hate the Cubs and Cards, but I hate the Dodgers the most, from back in the BRM days. Reds/Dodgers was a real rivalry in the BRM days but a lot of water has gone under the bridge. Cards/Cubs, yes, but my favorite to beat are the Nats. Me, too. Dodgers were the enemy starting on the day they left Ebbetts Field. Hope Scooter can win the batting title. However, it’s interesting how emphasis on particular batting categories can impact narratives. If the “batting title” was the label given for the player with the best OBP, certainly considered a more important batting category than AVG by now, Votto would be on the way to his 3rd batting title in a row and 6th overall (not to mention one percentage point in 2015 and a one-month knee injury in 2012 away from 8 overall!). It would be nice to “officially” say that Votto is a 6x batting champion at the end of the year. But, none of the other teams in the NL Central seem to be sitting still. The Cardinals Opening Day starter, Carlos Martinez…is now their closer. He picked up another save tonight. Rays have won 8 of 9 (15 games over .500) by starting relievers for an inning and trading anyone that makes more then a McDonalds manager. They’re doing something right and the Reds need to pay attention. The one guy they start in Stanek and he throws about 98-99. He just comes out like a closer and starts firing heat. I don’t know how the Reds could do it, but maybe start Hughes? If you’re facing a team like Atlanta with Freeman and Markakis then start Garrett? I feel like it does cover some holes and keeps the hitter from zeroing in a on pitcher in their 2nd-3rd atbat. I really like the idea of using an opener pitcher. On a similar note, I think baseball would benefit from losing some stats. If you remove the stat of ‘save’ I think managers would make different decisions. Or take out the stat of ‘sacrifice hit’ and maybe we wont bunt so much. I bet Robert Stevenson would benefit from removing ‘walks’. I saw Alex Wood pitch as a Friday night #1 at Georgia. He threw 94-95 mph then. He is barely touching 90 mph now with many pitches 88-89. Not the same 16-3 pitcher he was a year ago and shows how fleeting SP excellence can be year to year. The old Wood is the kind of lefty SP the Reds need. But the velo drop indicates a big problem. He’s either majorly fatigued or hurt. While it’s true that Suarez was terrible at SS, he was even worse when he first moved to 3B. I think in his first season at 3B he made more errors there than he did at SS the previous season. Although some of this could probably be chalked up to learning a new position, the simple fact is Suarez wasn’t just bad at SS, he was bad at defense, period. But then a funny thing happened last season. Something seemed to “click” for Suarez defensively, and suddenly he was a pretty good defender at 3B. My proposal is to shift him back to SS to see if whatever he figured out at 3B can also translate back to his old position. Let Peraza use his speed to roam CF (ala Billy Hamilton being shifted from SS to CF), let Suarez play SS, and let Senzel have 3B. My thinking is: Suarez very likely will not be worse than Peraza at SS. Peraza will almost certainly be a step down defensively in CF from BHam, but his offense will make up for it. And then of course, Senzel’s bat gets into the lineup. The net result would be, offensively, Senzel replaces BHam’s bat in the lineup, which should be a massive, massive upgrade. Defensively, Suarez/Peraza is probably a wash at SS (or Suarez might actually be better), Peraza/BHam is probably a downgrade, and Senzel/Suarez is probably a wash at 3B. Only one player would have to learn a new position (Peraza to CF), and he has the speed tool which already helps him get a leg up on being successful at that position. So a minor downgrade defensively for a massive upgrade offensively. I don’t see what’s not to like. It sounds good, but, when you start shuffling players, Their offense might regress. There will be more growing pains for Peraza in center. He looked awful in his attempts there last year. Suarez’s bat was awful during his 3B fielding woes period. Will his bat suffer like before from the pressure of SS defense? Will Peraza’s bat also suffer? I’d like to see Senzel try SS, but the Reds don’t think that’s an option. My 2nd choice would be Senzel in CF. Suarez was really good at third in 2017, and a case could have been made that he could transfer that to shortstop. But he isn’t really good this year, so it’s hard to imagine that he’d reinvent himself yet again by switching to a position with different and, largely, more rigorous demands. Peraza to center would be worth exploring, despite the unknowns, as would Lorenzen to center, though his hitting proficiency comes with a red-flagged sss warning. The thing is, I think in his career Suarez still has more innings at SS than he does at 3B, so it’s not like he’d have to completely learn a new position. I imagine the training and years he spent at the position would still apply. Loved reading, in the little Sheldon piece at Reds.com, Votto talk about hitting and working through his slumping power numbers this yr. Hitting is such an intricate skill and game of adjustments. And Votto is a master at it. 1000 times YES to this article. Lifting and pulling the ball was basically Votto’s answer to where the power has been. I’m surprised that it has taken him 5 months to realize this. Especially after so much success in 2017. He admits to possibly “overthinking” his plate approach. Steve I will say you were young and just developing and needed some big league experience, but your sarcasm tool has really come along nicely this season and with your wSC+ at 164 this year (weighted sarcasm created) you’re a lock for a starting slot next year. 1. Peraza to CF talk. BHam is so bad at the plate that I know this would be an upgrade, but the Reds have no one else at SS and Peraza would still not be a good offensive CF. 2. BHam leading off. BHam playing in favor of Schebler or Ervin. Enough. 3. The quick hook. Reed made one real mistake – the home run ball – but showed a lot in the scoreless, five out first, and yet he gets yanked early as if wins matter right now. Let him pitch, and LEARN. 4. Umpires still calling balls and strikes. It’s just too arbitrary. Last night it was Votto called out on ball four, but the list of bad calls is long and affecting all teams almost every night. The technology is plenty mature. Can we please resolve this once and for all? The Reds/Dodgers rivalry in the 70s was THE best in baseball. I was lucky enough to have grown up during the days of the BRM and remember the anticipation of every series between the two. Of course those series received national attention from the sports press. I remember an article in Sports Illustrated covering a series between the two in LA with a picture of Pete Rose in left field looking at smoke from a smoke bomb that a Dodgers fan had thrown at him from the stands of Dodger Stadium. The headline read: Ã¢â‚¬Å“Where ThereÃ¢â‚¬â„¢s Smoke ThereÃ¢â‚¬â„¢s IreÃ¢â‚¬Â. the move that makes the most sense to me for the future is moving Suarez to 1st. this will free up room in the infield for India and Senzel. Kind of like when the BRM moved Doggie to first. As far as the outfield is concerned ,I know I am in the minority here but I still think Billy is the guy in center. the Only other guy I see in our system that could compare defensively to Billy right now is Jose Siri and I am not sure he could bring much more offensively then what Billy Brings to the table. we will have stud corner outfielders with any combination of winker, Ervin, Schebler, Trammel so we do not necessarily need an offensive minded centerfielder. although I do admit this must be the last time we see Billy in the leadoff spot. he is the 8th or 9th batter of the future. Finally, I wish REDS fans would start going to the games. is there that much else going on in cincy on a cold Monday night? it is embarrassing when a California team has 3 x the amount of fans I n the stadium than the home club. tickets are 7 bucks and you can basically sit anywhere you want. you can find a parking spot for 5 bucks although you may need to walk a little bit. so 12 bucks for some great entertainment, not bad. and look. this team may not have the talent of the dodgers but they really played hard last night and are trying to win! What do you suggest the Reds do with the guy making $25 million a year and is leading the league in OBP? Maybe the DH is coming soon to the NL. Current CBA runs through 2021. That is three years of Votto on the bench if Suarez is at 1B. Maybe he will waive the no trade clause if he sees no progress, but I have seen no indication of that. I am not about to touch this one with a 10 foot pole. 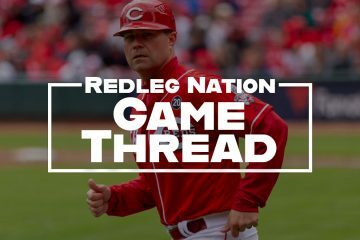 However, I will grab the opportunity to point out that the Reds have had a number of outstanding offensive performers and individual offense seasons over the last 4 years; and, none of them or their weight combined when they happened in the same season have been enough to lift the team from the 90 loss plateau. Then thrown in that for the same period they have had arguably the best defensive CF of a generation (or more). So, the problem has to be the pitching, right? Well obviously that’s been a big part of it. However given the other assets available to them, it seems to me to be taking the easy way to lay the entire mess of 90 loss seasons off onto the pitching. I believe there has been a dearth of leadership, a lack of planning, focus and effective execution of a plan from the owner’s suite through the front office and right down onto the field. Simply put, the pitching doesn’t have to have been as bad as it has been, even with the same group of arms; and the offensive potential could have been more effectively utilized. They need a rebirth such as when Walt Jocketty was handed his gold watch and sent on his way in StLouis. If the ownership can’t do this and get out of the way, then new ownership is needed. honestly I like Joey and lets give him another year to turn it around, but if he has another 11 hr season can we really afford him at a power position? I guess he could be our super pinch hitter, sub. That is a non starter comment. If there is one immovable person it is votto. Man leads the league in obp. Has power. Had a slump, longer then most, it happens. He is not interested in moving has a NTC, and is producing in the 4 WAR range on a bad year. Any talk about movong him is a non starter . Any talk about moving him and keeping billy is being done by someone on drugs, a cardinals fan or both. Gotta assume that he wasnt thinking. Does bring up a good point though, to be really good we need at least 1 extra good player on the bench for those DH games.